Eccentric FBI detective Paul Smecker tracks a pair of Irish-Catholic twin brothers acting as vigilantes pursuing the eradication of the Russian Mafia from the streets of Boston. Includes some absurd over-the-top scenes, so be prepared to frequently suspend disbelief. Followed by a sequel, The Boondock Saints II: All Saints Day (2009). 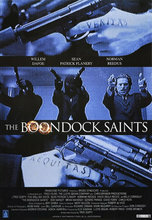 Boondock Saints has launched itself to cult classic status since it came out in 1999. Not popular, initially, it has gone the way of Rocky Horror Picture Show for fans of action, glory and humor. It stars two lovable Irish brothers who live quiet lives in Boston. But when their local bar becomes the financial victim of the Russian maffia they turn into heroes. From that point on they fight crime, kind of like super heroes, but without the costumes or the fancy gizmos. Instead they have their bumbling good luck, charm, and an arsenal of under the table weapons. Taking on mafiosa evil becomes their penchant, and they are dubbed the Boondock Saints. Willem Dafoe is also in this, and he is awesome, as usual. Its a must-see for anyone who likes him as an actor, and for anyone who exists in the 20-30 year old crowd.